Life can be unpredictable. All digital devices have the potential to fail and they eventually will. Your Android devices are no exception, it doesn't matter whether you use an Android phone or tablet. Chances are you may lose precious data due to various reasons from accidental deletion, memory card issue, to rooting error, etc. But, these lost files are probably not gone immediately — because you can use an Android data recovery tool to bring digital data from the dead, though there isn't a 100% guarantee, it depends on how you approach the recovery process and how the files are missing from your Android device. We're here to show you the best Android data recovery software, some work on PCs some on Macs. It's up to you to choose which one to go, and most importantly recover the stuff you want. **Below, you'll find our expert reviews, but you can also click the links above to get the software and learn more about each application. When do You Need Android Data Recovery Software? In short, if you can't find or access those precious data (e.g. Contacts, photos, videos, text messages, call logs, etc.) from your phone or tablet. And you haven't set up any backup options such as Google Photos, Google Drive, or any other kind of cloud backup services. Then your best bet is to try a data recovery program. You accidentally deleted some photos, contacts, etc. The MicroSD card attached in your device became corrupted. Failure of rooting your Android device. All data got wiped due to OS resetting or upgrade. Data were missing after ROM flashing. Android Data Recovery Software: What to Look for? Data recovery is tech-savvy business, and there's a wide range of Android file recovery tools out there in the market. Knowing which one is right for your situation can be challenging. Here are some factors we use to evaluate whether a product is good or not. Security: the first thing to look for is a software that is safe to use — i.e. the program itself should be virus-free and malware-free, and it should not damage your Android data so it must perform read-only procedures during the scan which is a standard process for all data recovery software. Recovery Options: whether you saved your data on your device internal memory or an e﻿xternal ﻿﻿memory card (usually MicroSD), the software should be able to handle both options. In fact, this factor alone has helped us knock out the majority of recovery programs which only support retrieving data from a removable disk or card. Supported File Types: a good Android data recovery tool must be capable of recovering as many types of files as possible, such as Contacts, messages, pictures, movies, audio, documents, call history, or even data from third-party apps like WhatsApp. Compatibility: you should also verify that the Android recovery software you select is compatible with the Android device you use, e.g. the most popular Samsung Galaxy, HTC, Google Nexus, LG, Sony Xperia, etc. Also, the app should be compatible with your computer operating system (i.e. Windows, Mac OS X) which you need to run the program. Technical/Support: if you have any technical questions or concerns using the software, you should be able to browse its official website for more information, or directly contact its customer support team via emails, phones, or live chat. We hand picked the five greatest options for you based on the criteria above. All the tools listed below are safe to use. Be sure to check PC/Mac compatibility information before you proceed. Known as the world's 1st Android smartphone and tablet data recovery software, Dr.Fone is our top-rated option. It supports over 6000 Android devices and be able to recover eight different file types including common ones we mentioned above. Best of all, the software is very simple to use with incredibly easy-to-navigate recovery options available on the interface. You can run the program on your Windows PC and OS X based Mac. Another powerful yet efficient software that can quickly scan your Android device to find and retrieve lost files. With only three steps: connect your device, scan & search, and recover your data, it could save you a trip for visiting a local phone repair shop. The program also supports recovery from all popular Android devices from Samsung, Google, Huawei, ZTE, LG, and more. Both a PC and a Mac version are available. Boasted as "the No. 1 free Android data recovery software", the program allows you to retrieve three types of files (text messages and attachment, Contacts, call history) for free, but not for other file formats. FoneLab also supports data recovery from both Android internal memory and external mass memory card. In addition, you can use the app to safely root Android, though we don't recommend you to do so unless you know what you're doing. Like its name tells, the program is specifically designed to rescue lost data from Android phones. 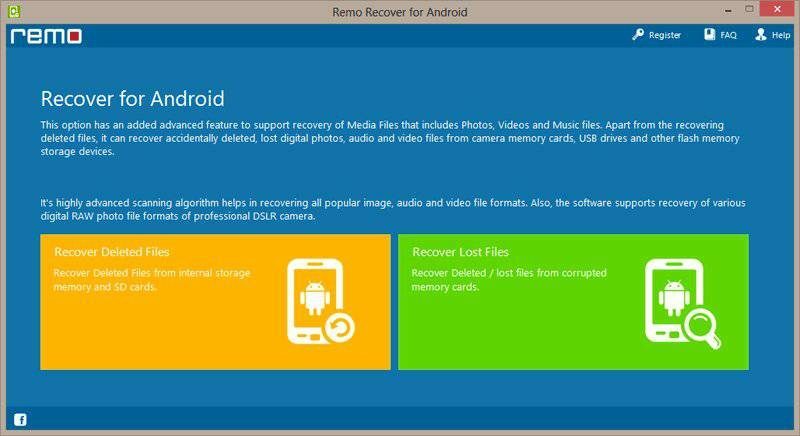 Remo is able to scan both the internal and external phone memory of your Android device to locate deleted or lost files, including Android application package files (APK). Currently, the software is only available for Windows PCs. Developed by the Tenorshare team, Android Data Recovery Pro offers two connection methods (Wi-Fi connection and USB connection) and two recovery modes (Quick Recovery and Deep Recovery) — that makes it another comprehensive solution. Besides, the software can recover eight types of file formats from all kinds of Android devices. It's compatible with both Windows and macOS. Disclaimer: this best Android data recovery review is based mainly on 1) our own experiencing using and testing different programs on our PCs and Macs, 2) the information provided by each software vendor often available on its official website, and 3) the expertise of Android geeks from whom we consult. As such, the reviews are our own opinions. We strongly encourage you to do your own research and if none of the above software works for you, bring your device to a computer repair shop nearby or a data recovery center for services.